The first step your child may take into the Scouting movement will be to join the Beavers. The Beavers section was started in 1986 to cater for the 6 – 8½ age group. Beaver Scouts are the youngest section of the Scouting family. Their activities are based around making things, outdoor activities, singing, playing games, going out on visits, investigating nature, listening to stories, learning how to be safe and most importantly, making new friends. Oh! and collecting Badges and Awards of course! We have buy modafinil online fast shipping a Parent’s Guide to Beavers which gives a brief introduction to the section, outlines the types of activities young people take part in and the skills young people will gain. This guide can be downloaded from click here or hard copies obtained from our District Scout Shop. 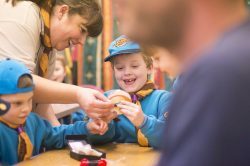 There are a number of Beaver Scout colonies in Mersey Weaver, all guaranteed to give your child some amazing memories, so what are you waiting for? Join the adventure today!